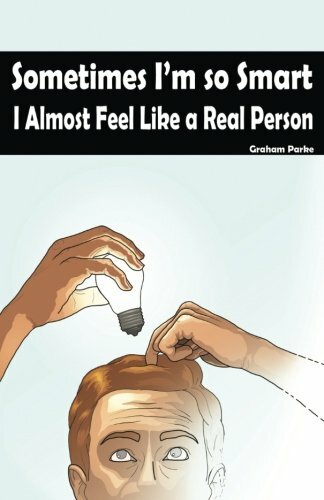 I received a copy of this book for free from the author, Graham Parke, in exchange for a review. Leverage [AKA Harold] is a loser. He's thirty-something, living at home with his mom, and invests all of his free time in his very low-rent YouTube channel dedicated to finding The One. [not even close to the current 1,000 follower monetization threshold] At the same time, I kind of like Leverage. He is a Millennial everyman, just trying to get by in a world that he didn't create. I am a respecter of the principle Fake it Until you Make it, which has a venerable pedigree under other names. Leverage is definitely faking it. His YouTube channel, which gives out relationship advice for young men looking for their soulmate, is a comically inept mashup [parody?] of the kinds of things pickup artists say with a sweet innocence and naïveté that really is endearing. The snapshots of the comments on his videos in-between chapters really do have the feel of YouTube comments, a mix of fawning admiration and brutal, but unhinged, honesty. I found the book a little slow to start. But this may just be a reflection of the quiet desperation of Leverage's life. He has a decent, but soul-crushing, corporate job. He lives with his mom, presumably because he lives somewhere expensive. It wasn't really spelled out in the book, but it felt like Toronto to me. He has also fallen deeply in love with the girl who sells nuts at the store in the mall. Unfortunately for him, at the same time that Leverage is documenting his wise-isms about The One on YouTube, Emma, the nut girl, is friend-zoning Leverage so she can use him to test ideas for her dating blog. This is further complicated by the sudden appearance of Leopold, one of Leverage's fans, who since he lacks tact and good sense, simply bulls ahead and uses Leverage's techniques to good effect on Emma. This is the obvious source of conflict and drama, and while I appreciate the dark humor of it, if this was all there was to the story, I couldn't really recommend the book. I do recommend the book, because Parke has done something far better than this. Just as Leverage says in the beginning of the first chapter, he really is like moss, he grows on you when you aren't looking. The book, and Leverage, got better with time and reflection. He really is a good kid, and he has a way of looking at the world that allows him to see things afresh, not quite like anyone else. He really does have a gift. It isn't his fault that his life was made a desolation, and called peace. Leverage's [and Harold's] slow journey to knowledge and wholeness is both devastating and sweet. This ended being a far better book than I expected.